Which is the best dogsled tour in Sweden for you? Why go dog sledding in Sweden? Sweden's vast areas of lowland lakes and forests are ideal for husky sledding throughout the winter, so the season for dog sledding is very long. Typically snow conditions are suitable for sledding by around mid-November and the season continues all the way to late April. 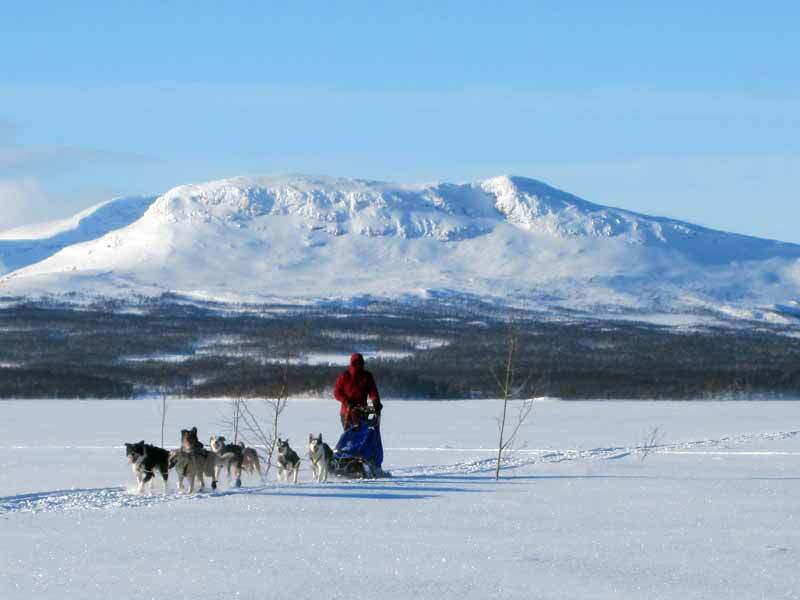 Swedish Lapland also has spectacular mountain regions which are perfect for more challenging dogsled tours, staying in mountain cabins or even winter camping. Some of our mountain dogsled tours are possible throughout the season, while others take place only in the later part of the winter from mid-February onwards. You have very good chances to see the Northern Lights during your tour, as you are dog sledding in the far north and in areas away from light pollution. The Northern Lights can be seen on any of our husky tours in Sweden throughout the season up until around early/mid-April, when the nights start to become too light for the Aurora to be visible. Adults drive their own sled for all our dogsled tours in Sweden. Photo: James Padolsey. Our seven options for dog sledding in Sweden range from family-friendly trips to challenging wilderness expeditions. None requires previous sledding experience, but for the more challenging tours it is important that you have an appropriate level of fitness and are used to the outdoors. You'll find more information on the requirements for each dogsled tour under "Good to know" on the relevant tour page. You are an adult solo traveller or group (children min. age 15 also possible) looking for an adventurous tour in a very remote area, but perhaps don't want a full week's dog sledding. Most tours are 5 days/4 nights (with 3 days' sledding) with some dates 6 days/5 nights (with 4 days' sledding). Tours are possible throughout the winter from November to April. You like very personal, small-scale experiences. Maximum group size is just 4 persons, which also makes it ideal for small private groups of friends (up to 5 persons can be accommodated on private tours). In Vindelfjällen you may well have the world to yourself! Photo: PK. The Vindelfjällen Nature Reserve, located in north-west Sweden, is Europe's largest protected area but there is very little tourism here, so you'll really be getting "away from it all" and may well meet no-one else during your trip. This tour takes you up through the lowland forest into a landscape of open, rolling mountains, so you can experience the adventure of mountain dog sledding right through the winter season. As a dogsled tour partly in the mountains, this tour can be physically challenging, especially in heavy snow conditions, and requires a general good level of fitness, but is a very popular choice for a wide range of guests. Accommodation is first and last night in comfortable cabin near the kennels and nights during the tour in simple wilderness cabins along the route. An adult solo traveller or group looking for a fairly accessible multi-day dogsled tour (total 2 days' sledding + short sled in morning of Day 4) long enough to realy get "into" your mushing adventure without the commitment or extra physical challenge of a longer tour. Tours are offered throughout the season from November to April. Adult(s) with children aged min. 6 (adult and family guests are not mixed within the same tour group) who you are confident will enjoy a multi-day winter experience of this kind. Children under 16 will share sled with an adult. 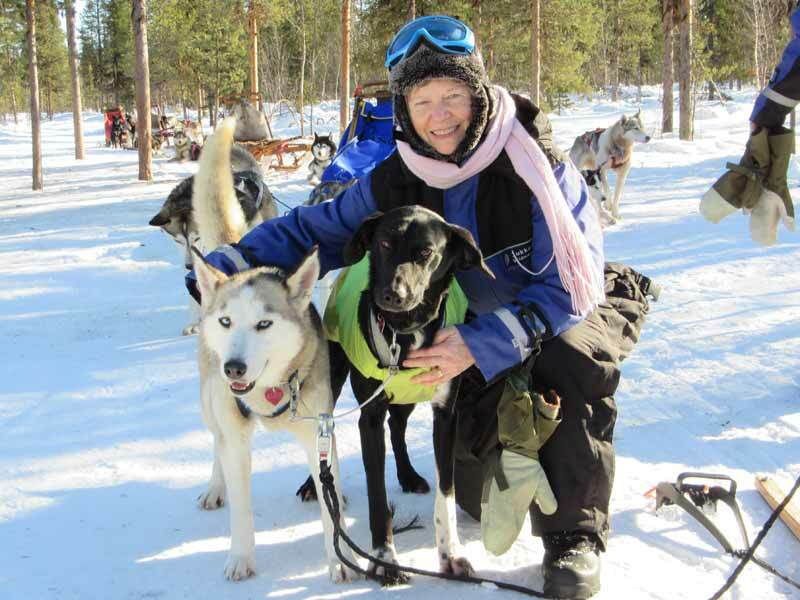 You would like to combine your Sweden dog sledding tour with other activities. Located near Kiruna in the far north of Sweden, this tour makes an ideal combination with, for example, the Ice Hotel in Jukkasjärvi. 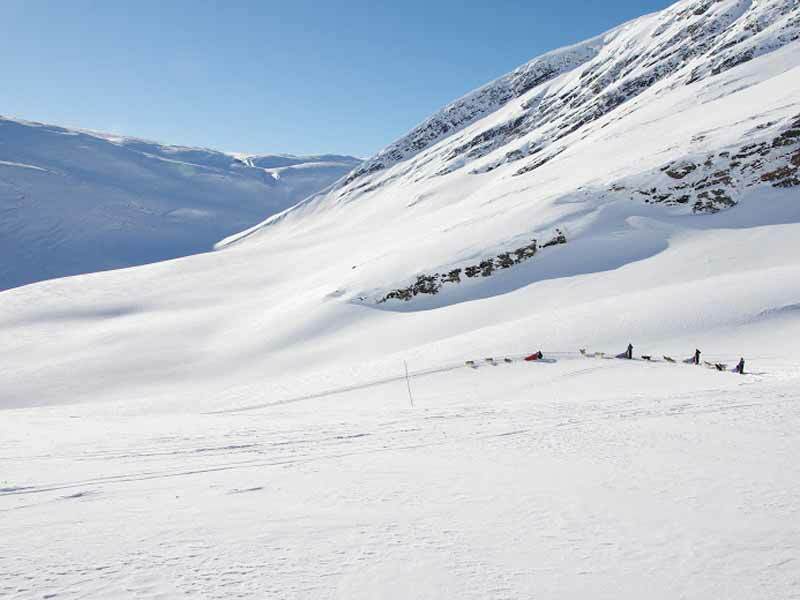 Snowmobile tours can also be added as an optional extra in connection with the start/end of your dogsled tour. This tour is suitable for a wide range of both adult and family guests. Photo: Ian Cameron. Running in a beautiful landscape of frozen lakes and forest, you will drive your own dogsled team, normally staying one night at the kennels on arrival and two nights in simple cabin at the wilderness camp. Children under 16 are half price and travel is straightforward, with regular domestic flights or night train services between Stockholm and Kiruna. The kennels are located just 20 minutes from Kiruna town. 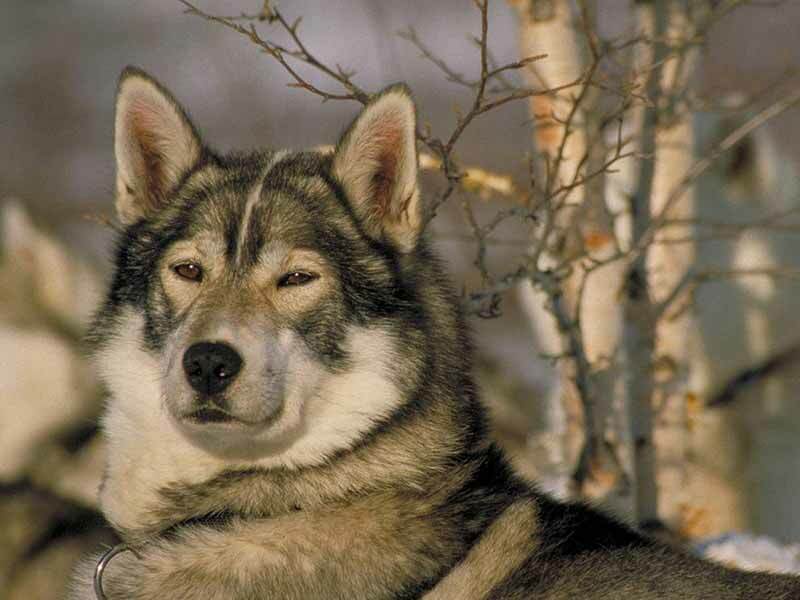 You are an adult solo traveller or group wanting a longer dogsled tour (6 days' sledding) in a lowland area. Tours are offered weekly from December to April. This tour is also a great option for private groups of adults or even older school groups (min. age 16). Max. group size is 6 persons for public tours but 7-8 persons per group are possible for private tours. The beautiful dogs are always the real stars of any dogsled tour. Photo: M. Rullander. This is an extended version of Discover Dog Sledding in Lapland, spending today 6 days' sledding and staying in wilderness cabins with a combination of day tours from fixed location and sledding to new cabins. Choosing a longer dogsled tour increases the level of physical challenge, but being a lowland landscape, the tour is still accessible to a wide range of participants. A week-long tour really gives you the chance to immerse yourself in the sledding and the landscape, and to get to know and love your husky teams even more! You should choose this tour? You are an adult solo traveller or group wanting a fairly challenging week-long dogsled tour (6 days' sledding - a longer 10-day tour with 8 days' sledding is also available) in spectacular mountain scenery and wish to travel from mid-February to April. You have always wanted to experience the King's Trail, Sweden's most famous long-distance trail. This tour normally runs on the section of the trail between Abisko and Kebnekaise, staying in mountain cabins along the route. The mountain scenery in this area makes a stunning backdrop to the tour. Photo: Alistair McGregor. Dog sledding in the mountains adds an extra dimension to any tour. With a number of uphill sections, you will need to assist your husky teams regularly by "scooting" with one foot or pushing/pulling the sled. Weather and trail conditions in the mountains can be very variable, so the level of physical challenge and the sledding time needed between the overnight cabins can be different for each tour. In deep snow or challenging weather this can be a physically challenging tour, especially on days gaining altitude. In good weather with hard-packed trails, the daily distances can be covered relatively quickly - in the mountains, nothing is predictable! The stunning mountain scenery and the experience of life in the mountain cabins, where you will also meet other adventurers doing the King's Trail on skis, makes this a very special choice for a dogsled tour. 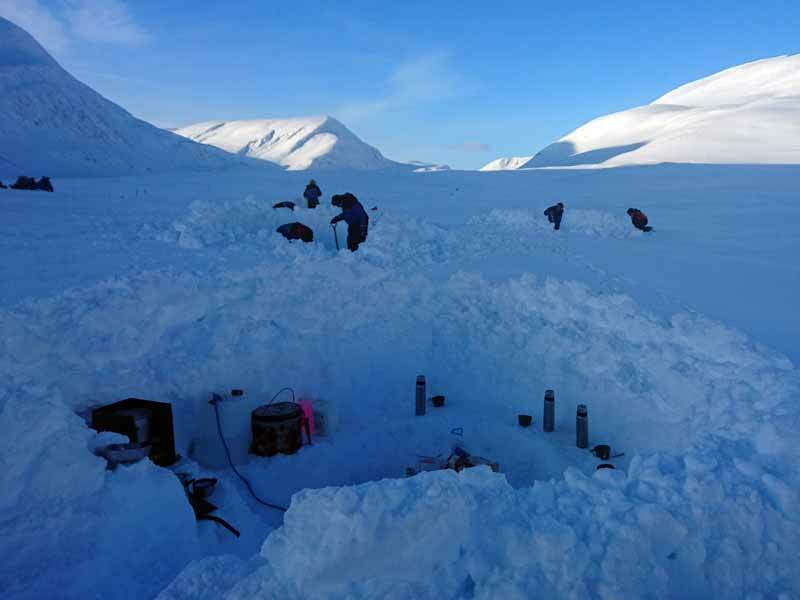 You are an adult solo traveller or group interested in the Husky Mountain Expedition outlined above but wanting a week-long dogsled tour (6 days' sledding) with the extra challenge and adventure of winter camping. The element of winter camping adds an extra level of challenge to any tour. Photo: Jenny&anbsp;. Normally following the same route as the Husky Mountain Expedition cabin tour, this winter camping alternative increases the level of challenge, as you will need to prepare camp each night for sleeping under canvas! As with the Husky Mountain Expedition, variable weather and trail conditions can greatly affect the level of challenge encountered,making this a real winter adventure for which you should have a good level of fitness and be used to outdoor life. You will normally camp near the mountain cabins to be able to make use of some of the facilities there. You are a solo adult or group looking for a challenging wilderness dogsled tour in the later part of the winter (tours are offered in late March and April), typically covered greater daily distances than is possible for other mountain tours. This tour is also ideal for private groups and is a very personal and small-scale expereince with group size just 4 persons. You want to drive a team of racing-trained huskies through one of Sweden's most remote areas. 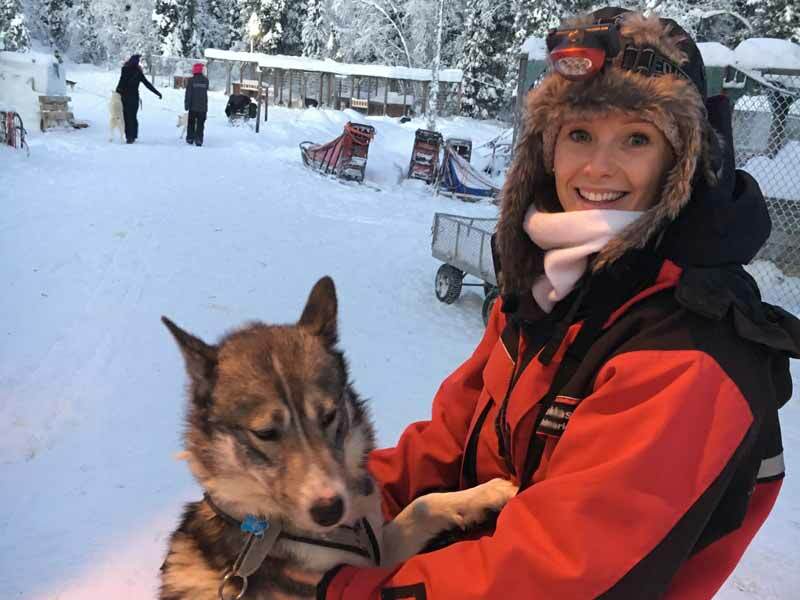 You have been dog sledding before and are looking for a "next step" experience (previous sledding experience is not essential, but this is an excellent choice for guests who have been dog sledding before). 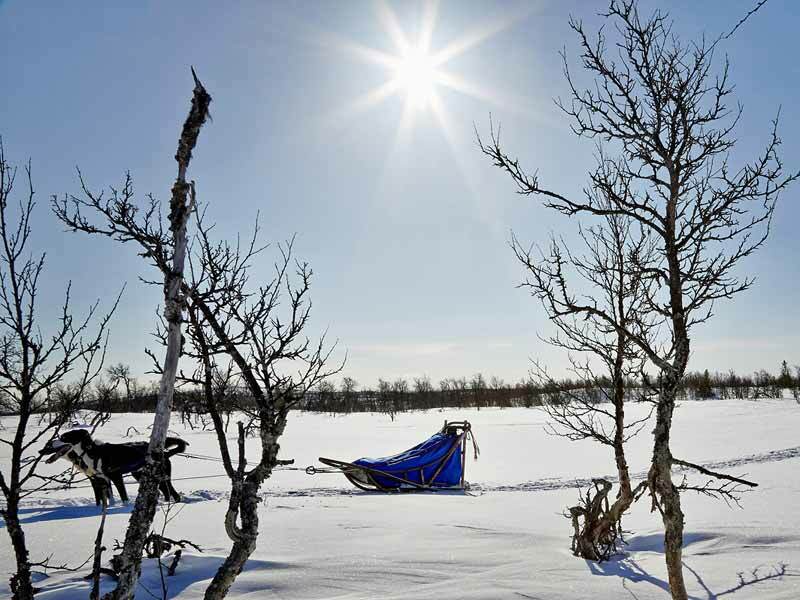 This is the most challenging and remote of our Sweden dog sledding tours. Photo: PK. A unique opportunity to drive competition-trained husky teams through a stunning landscape of rolling mountains in north-west Sweden, this is the most challenging of our dogsled tours in Sweden and is a real "bucket list" adventure. Accommodation during the tour is in wilderness cabins along the route, with the option to camp on some nights. The itinerary for this tour can be varied to take account of weather and trail conditions and to a certain extent the abilities/experience of the guests. First and last nights are in comfortable cabin near the kennels. You are an adult solo traveller, group or family with children (min. age 6). 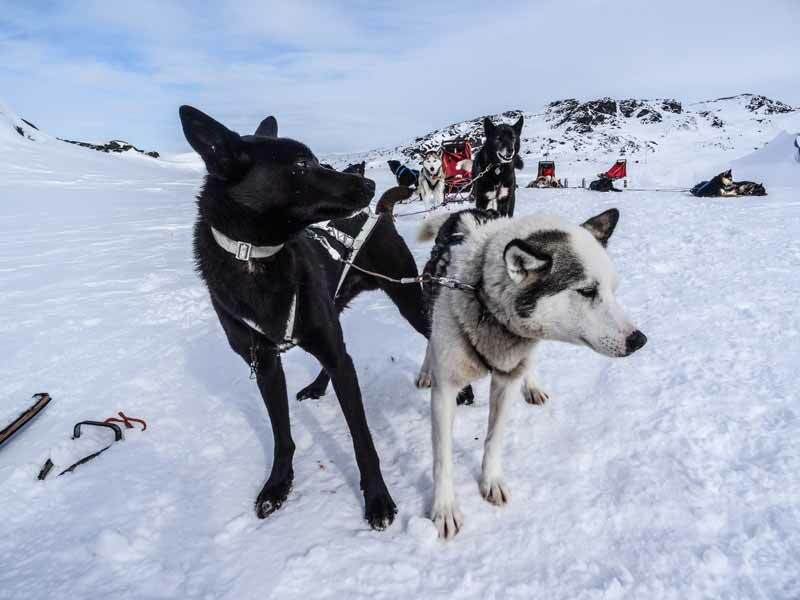 You are travelling to the Kiruna area in the far north of Sweden for other activities and wanting to do a short dogsled tour as one of your activities rather than a longer tour, but would still like the option to drive your own sled and work closely with the dogs. Working closely with the huskies is a feature of even our shorter tours. Photo: Jenny Simpson. These options are shortened variations of Discover Dog Sledding described above. Choose between a day tour with no overnight accommodation, or the Overnight tour, which starts with pick-up at 13.00 on Day 1. You sled to wilderness cabin where you enjoy the experience of simple cabin life (with sauna!) for the night, before short sled back to kennels the following morning. This is a very good choice if you have not been sledding before and are unsure whether you or your children would enjoy a more extended trip (you can always return for one next winter! ), or if you are short of time.